Unlimited available	 Care Plus MFA / CPR / AED Infant, Child, Adult $75.00 Friday, March 27th, 2015 Omega Safety Training. Inc. Unlimited available	 Pediactric MFA / CPR / AED $50.00 Friday, March 27th, 2015 Omega Safety Training, Inc. 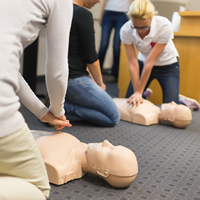 Unlimited available	 Adult Medic First Aid / CPR / AED $50.00 Friday, March 27th, 2015 Omega Safety Training, Inc. Unlimited available	 Blood Borne Pathogens $25.00 Friday, March 27th, 2015 Omega Safety Training, Inc.